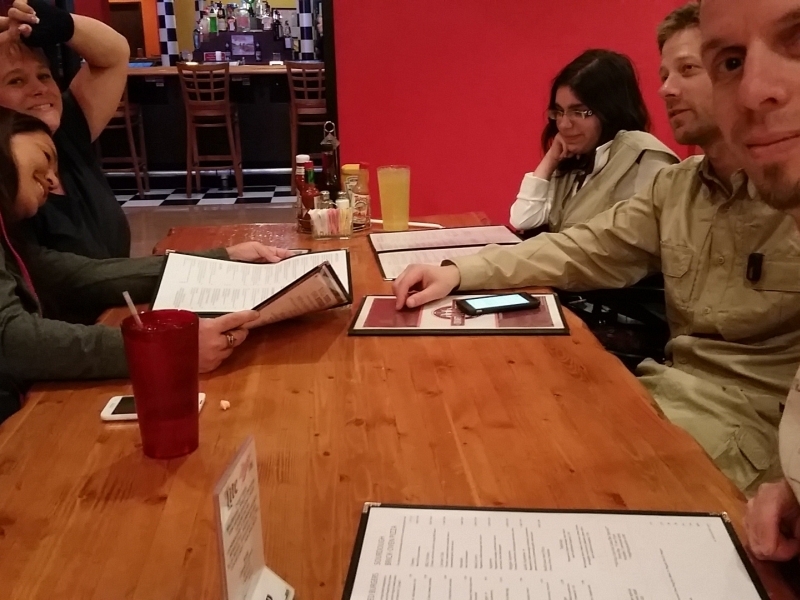 After a successful fund raising campaign and several months of planning, purchasing supplies, and arranging travel and lodging the anticipated weekend of Marissa's meteorite hunt was finally upon us. Marissa and her two staff, Debbie and Autumn, flew from Ohio to Las Vegas one day ahead of me. They were greeted by Rogan, the gentleman who arranged the crowd-source funding campaign, who was showing up all the way from Canada as a surprise to Marissa. He had maintained all along that he wouldn't be able to make the trip, so you can imagine her surprise when he met them in baggage claim. They all spent the day in Vegas and saw the sights of Sin City before retiring to the hotel in Pahrump, about an hour's drive away. 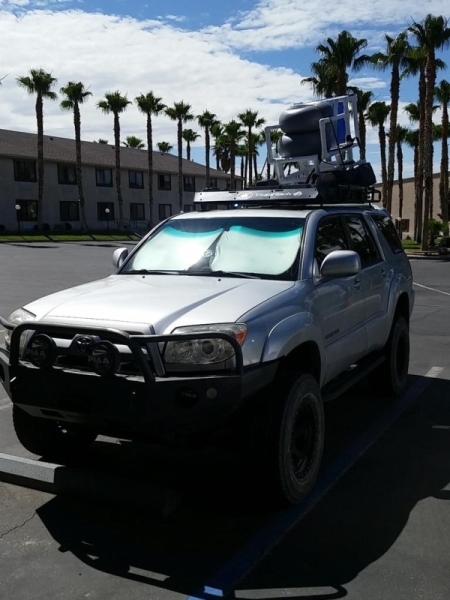 I woke up early Friday morning and hit the road, I had planned to get into Pahrump around 11am to meet up with everyone for lunch. 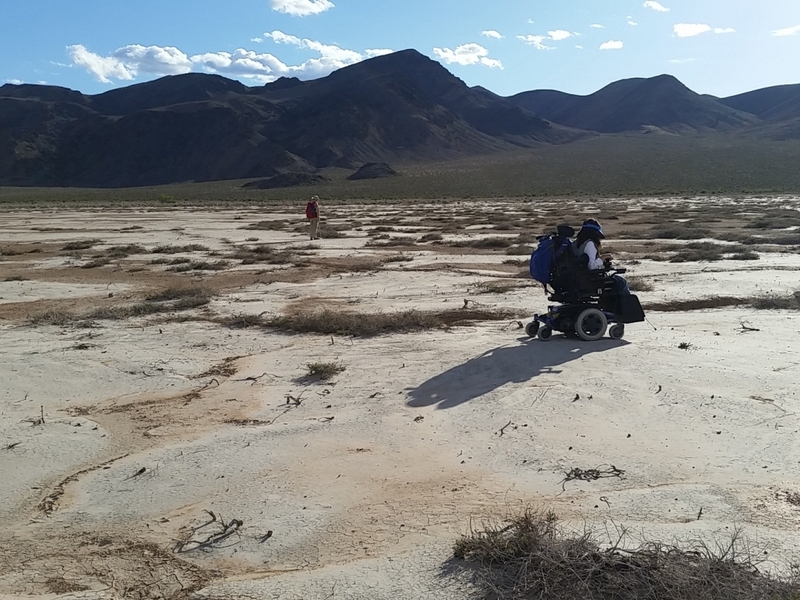 I got a phone call from Rogan just as I turned north on highway 127 that the bubble chair, a manual wheel chair with large balloon tires that can be used on sand, was in Vegas but they wouldn't be able to get it to Pahrump until Tuesday. That wasn't going to work, our last day hunting was Sunday, so Rogan and Autumn drove the rental van to Vegas to pick up the spare chair while I finished the last leg of my drive. The 127 winds its way north out of Baker toward Death Valley, and the terrain it takes you through is very similar to the National Park; it's a very nice drive. It's one of those rare roads where you completely lose cell phone reception, and not even Google's street view mapping car has driven down it. I arrived at the hotel and finally got to meet Marissa in person after communicating with her over the past almost a year. I unpacked a bunch of my gear and Marissa, Debbie, and I headed in to town to pick up some supplies while we waited for Rogan and Autumn to return. I had built some ramps out of 2x8 lumber so that we could load Marissa's chair into the back of my truck and they worked perfectly; however, Marissa's chair was a little bigger than I had expected so for this first go I had to fold down one of the back seats and roll down the rear hatch window. That setup wasn't going to work to get all 5 of us out to the field, so I would re-evaluate the situation after lunch. After returning to the hotel and eating our sandwiches I got my maps and meteorites out right away. I laid the maps out on the bed and showed her where we would be hunting. I also showed her how close to Death Valley we would be, it is just on the other side of the mountains. I brought almost every meteorite I had personally found with me, and while we were checking them out Rogan and Autumn arrived with the bubble chair. Rogan brought us each a gift - a small Whitecourt iron meteorite that he found himself! How cool was that? We finished up with meteorite show-and-tell and then quickly loaded up our gear and headed out to the field, Stewart Valley here we come! 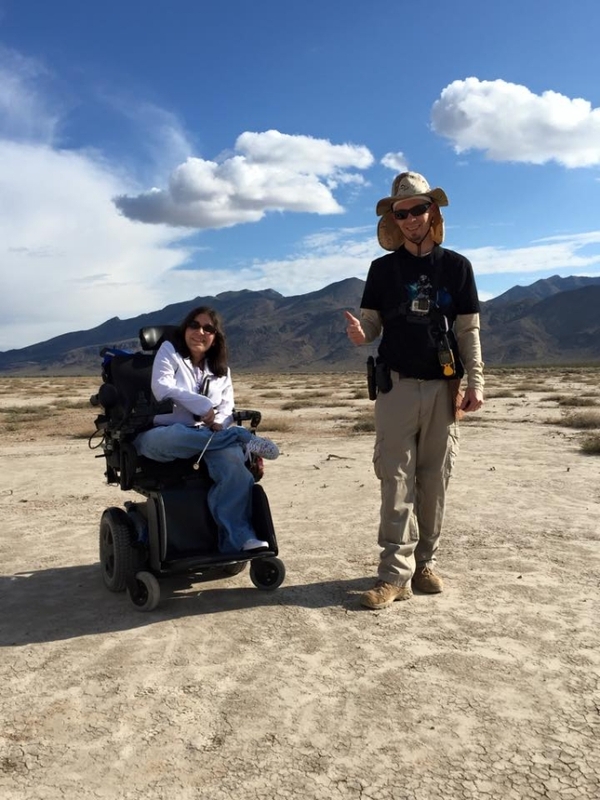 It was time for the first ever wheelchair meteorite hunt, and we could hardly wait. By the time we arrived at the parking spot I had selected on the Nevada side of the state line it was almost 5pm, but luckily the Summer Solstice was only a month away so it would stay light until after 8pm. We would be picking up where I left off searching the last time I was here a year ago with my friend Mark. We had ended that day with several finds, so I was hoping there were more past where we had stopped searching. 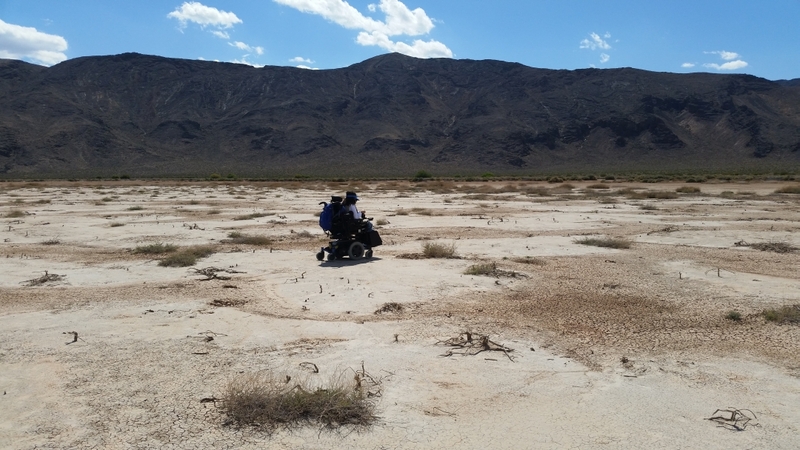 While us 3 hunters were checking our gear and Marissa was getting used to her chair on the dry lake I gave a spare magnet stick to Debbie and she set out searching. I think only 5-10 minutes passed before we heard her call out, "I think I found one." I ran over to her about 50 yards from where we parked, and there on the end of her magnet stick was a Stewart Valley meteorite fragment. Rogan, Marissa, and I quickly finished getting ready and the hunt was on! As the three of us searched toward Debbie's find Rogan pointed to a rock under a dead bush and asked Marissa to check it... *click* a meteorite hopped up to her magnet stick! "That doesn't count," she told Rogan, "you found that one! ", so Rogan began documenting his find while Marissa continued to search the area. Marissa was serious about searching, this had been a dream of hers for many years, her determination visible in the photo below as she sights in on Rogan's meteorite. While Rogan was recording his find I asked Debbie to show me exactly where she found her meteorite so I could record its location in my gps. She showed me the scratch on the ground she had made, and I logged the point. As I turned back toward Rogan and Marissa I spotted my first find of the weekend, a 0.46g fragment. ...Marissa, meteorite finder! I can't remember exactly who said what, it was too exciting, I'm pretty sure we were all shouting, I still haven't reviewed my GoPro video footage so hopefully it was captured there. All three of us were now documenting finds at the same time, we couldn't have dreamed of a better way to start the weekend. This is what meteorite hunting is all about. Marissa's first meteorite find, most probably a fragment of H6 chondrite. Just after 6pm I happened upon my second find, a 0.82g fragment next to a dead bush. As the sun crept closer to the tops of the mountains Rogan made his second find, followed soon after by Marissa with her second meteorite as well. Marissa's second find had fusion crust along one edge, the fragments with fusion crust are much less common at Stewart Valley, so it was an extra treat. Our shadows grew longer and longer, and finally they disappeared. I ended up with the last find of the day, my third weighing in at 0.83g. 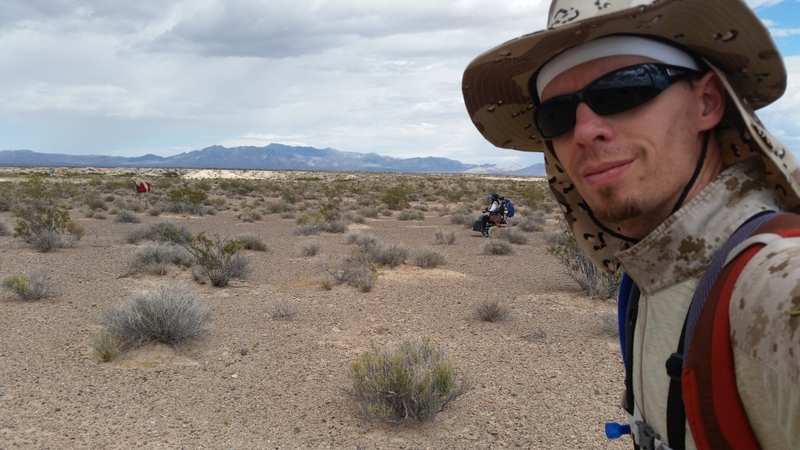 The first day was a huge success, everyone who looked had found meteorites, a total of 9 Nevada finds, it was more than we could have asked for. We celebrated with a drink and some fireworks before packing up the truck and heading back to town for dinner. After dinner we drove about 30 minutes north to escape the city lights and do a little star gazing. Even with the glow of Las Vegas on the horizon 70 miles away the sky was amazing. We saw several shooting stars, and the Milky Way like you only see it in the desert. Day 2 began with a hearty breakfast, then we loaded up and headed back to Stewart Valley. We would be spending the second day hunting a portion of the lake bed in California, adding another state to Marissa's meteorite hunting résumé. The bubble chair came with us into the field each day on my roof-rack in case it was needed, but luckily Marissa was able to use her own chair the entire weekend. We parked just on the Nevada side of the state line and unpacked the back of my truck. We quickly realized that we had left Marissa's meteorite stick in the hotel room, oops! I pointed Rogan and Marissa into California to look for meteorites without me, Rogan would use his magnet stick for both of them, and Debbie and Autumn relaxed Club Med Nevada Dry Lake style. The temps never got much above 80*F, the following weekend it would be over 100*F at the same location so we lucked out. I made it to the hotel and back in less than an hour, parked, and started walking directly over to Marissa and Rogan, I could just make them out in the distance. 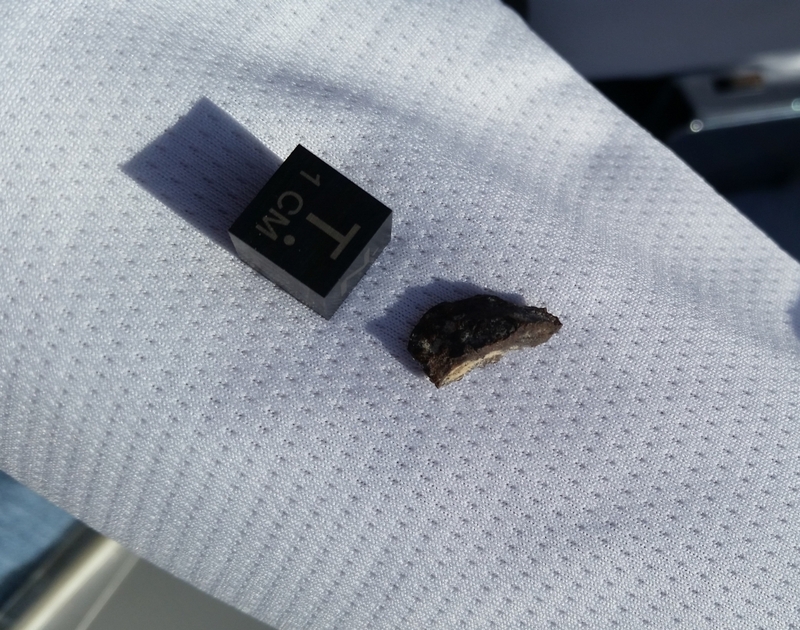 I was only a couple hundred feet into California when I spotted my fourth meteorite, a 1.25g fragment. I couldn't believe my luck, if those two had been anywhere else when I started hiking out to them I would never have seen it. I took this photo so that Rogan and Marissa were directly behind the meteorite in the blurry background, although they are not visible in the picture. I caught up with Rogan and Marissa and showed them my find. They hadn't had any luck yet, but judging by the tracks I saw on my way in they were able to get a good bit of hunting done while I was gone. 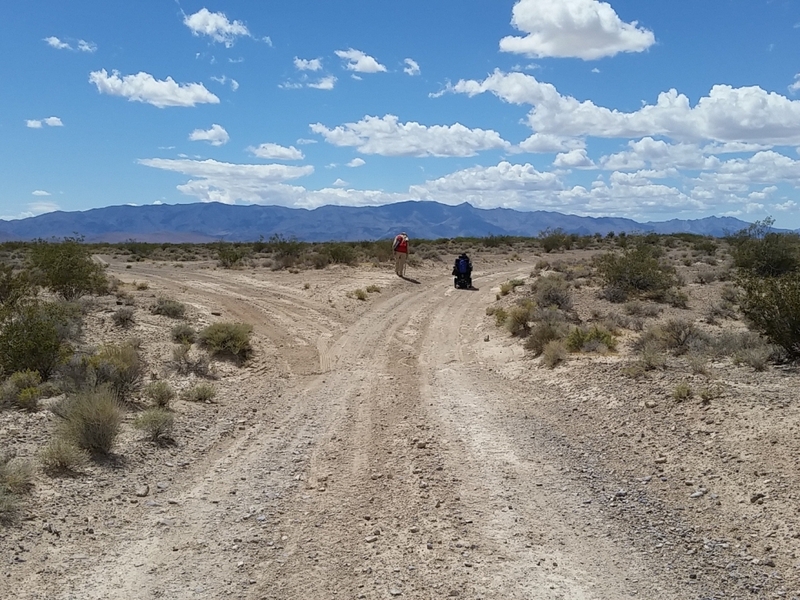 Marissa searched for meteorites while clouds and their shadows crept across Pahrump Peak in the distance. Her chair was not technically meant to be used off-road, but its large drive wheels and wide tread worked perfectly, with a few exceptions when the occasional soft spot was encountered. Rogan brought what he called "a Canadian magnet stick", and as I summarily guessed it was made from the handle of a hockey stick. It did the trick, however, and early in the afternoon on day 2 Rogan made his third find, our group's second find in California. The geology on display in Stewart Valley rivals that of anywhere else in the desert. I enjoy it here more than Death Valley because there are no tourists, no roads, and no fees. Three happy meteorite hunters, the smiles tell the story. We headed back to my truck for a late lunch and had to charge Marissa's chair while we ate. Luckily my Toyota has a built-in inverter, because the soft terrain really made the chair work hard and the batteries were almost empty by 4pm. While we were eating we spotted another vehicle on the lake bed, it was parked right where we were going to end the day hunting. We finished up lunch and loaded up my truck and I drove it over to park at the new hunting spot while the rest of the group made the 1/2 mile trek and looked for meteorites along the way. The other vehicle turned out to belong Jason Utas, whom I'd met a few times previously at various meteorite events. He and a friend were out hunting and had found a couple as well, good times! We finished up day 2 without any more luck, lit off a few more fireworks (on the Nevada side, where they're legal), then drove back to the hotel for dinner. The restaurant in the hotel has really good food, which makes it nice to come back to after a long day in the field. We started day 3 with a trip to the Stump Spring Dense Collection Area. Our chances of finding a meteorite were not as good as at Stewart Valley, but the new location offered Marissa a chance to hunt a completely different surface so we loaded up and headed out. Upon arriving at Stump Spring Rogan, Debbie, and Marissa found a horned lizard and grabbed a couple photos. We hunted along the shoulders of a few of the BLM trails. When the open desert was firm enough we were able to venture further off the beaten path. There was a storm in the mountains behind us, but all we got was the smell of desert rain. The rain would stop at the foot of the mountains, the open desert remained dry. After a few hours at Stump Spring and nothing stuck to our magnets we decided to head back to Stewart Valley for one last try. We went to a part of the valley I had never hunted before and went to work. The three of us were really able to spread out and cover a lot of ground, and the scenery was stunning. Just about the time I was starting to wonder if I brought us to a bad spot Rogan made his fourth find of the trip. Unbelievably it was less than 10' from tracks that both Marissa and I had made an hour or so previously. Luckily he found it, third time's the charm. Rogan's find turned out to be the last one of the trip, and with the sun setting on Pahrump Peak a lightning storm rolled in to our north. Huge bolts of lightning arced through the clouds, it was way more impressive than the fireworks I'd lit off on the previous two nights, and a fitting end to an epic weekend of meteorite hunting. We all sat down for a final group dinner back at the hotel. Rogan is a geologist and had been collecting interesting rocks all weekend. He let Marissa pick a few of her favorite while we also laid out all our meteorite finds from the past three days. Debbie left her 2 finds in the hotel room, but the rest of our finds are pictured below. Rogan's on the top, Marissa's in the middle, and mine on the bottom. My four finds cleaned up to reveal a small face of fusion crust on each one, facing the camera in the picture below.